64 p., 1 leaf of plates : col. ill. ; 16 cm. Imprint also notes publisher's location in Edinburgh. J, '* ..... .' '^ / .. ..
" .' N, ,.+ ,. l *% V v "
. :~: r- > ^ . U^*'^ ^^ H *^^ ,.-'. less, that are lavished by loving friends on rich boys? able beings, the town's poor-in our village. 8 OVERCOME EVIL WITH GOOD. ner all the year round, and often a good mess for the cow. row of currant-bushes, and, latterly, a bed of strawberries. Ellis often said when busy in her garden. nice present for a neighbour, now and then, out of it. 10 OVERCOME EVIL WITH GOOD. to another doing it too. taken four of them out for you, Willie." lings a pair for ducks of this breed." worn every Sunday since father died. kind to others' offspring as to their own." 12 OVERCOME EVIL WITH GOOD. them, lest they should trespass on the captain. ning through his garden. Willie's heart misgave him. fence; and then, merely saying, I gave you warning,"
he turned and walked back to his house. I'd kill him said Sam. "I'd burn down his house for him!" said Bob. 14 OVERCOME EVIL WITH GOOD. but his tears still came as fast as he could wipe them. and I wish he was." "Well, mother, was not it just like murder ?" "No, my son, not nearly so bad as murder." think it was just as bad as Herod killing the innocents. ished any way, mother ?" he should hate Captain Stout as long as he lived. "I had rather be myself, a million times, mother." better off than he that does it ?" "Yes, mother, I suppose so, but it's dreadful to bear." "Then should not you be sorry for Captain Stout ?" "Sorry for him! I can't feel so, if I ought." "I hope he will! I hope he will feel awfully!" What did you copy them off for ?" "So that I might remember them." "Why did you wish to remember them ?" if ever I had a chance." Have not you a chance now, Willie ?" 16 OVERCOME EVIL WITH GOOD. into your heart to see whether the feeling is there." shall do right, he has taken the first step towards it. hate him a bit, nor wish anything bad to happen to him." build up the kingdom of heaven in our own hearts." careful mother could save in her small and frugal family. 18 OVERCOME EVIL WITH GOOD. keep my fingers warm holding on to your nice warm tail! for the best winter wheat. and showed them the salt. They came towards him. sight. What are you about, Will ?" he cried out. "Getting these steers out of the captain's wheat-field." "The more fool you don't you remember the ducks?" "Oh yes; I never shall forget them." an inch to drive them out." were licking up the salt he had strewed around. "'Lose the opportunity !' Will; what do you mean "
will overcome other. people's evil with your good." are our cattle, and I should have had the damages to pay. the news of the cow's death. time she is six weeks old." all his news, bad and good, to his mother. fully they had been driven out by William Ellis.
" William Ellis! William Ellis!" exclaimed the old man. would have turned the cattle in instead of out "
had talked to him a month about the duty of submission. "I was afraid you would feel dreadfully." had been in seeing the cattle just in the nick of time. or praise you for it." reward enough for our best actions." So I know it is, mother." opened upon the street, and Willie was just passing it. connected with the house by a shed and wood-house. 22 OVERCOME EVIL WITH GOOD. but fire and water had ruined poor Willie's new cloth. harm." Oh, this no thought, how many buildings it burns ! time of night ?" asked Captain Stout. go the right way to work to put out the fire ?" held it up than when you laid it down." a hundred times since. But what is the matter, boy ? to do-" Willie paused and hesitated. "What do you boggle about, boy ? don't be afraid." Ellis, when I wrung your ducks' necks ?" 24 OVERCOME EVIL WITH GOOD. for one who had offended and injured him. turn, I shall be glad for the poor boy." the poorhouse on trial. Good-morning to you, widow,"
amples, we may make something of Nat Boyle yet." soon found it was not so very easy. would carry them up to Mrs. Bemis. you ought to do for others and do not like to do." it is, the better we feel when it is done. him, and told him she had been looking out for him. and he asked her why. I will tell you, Willie. You know my little bantams?" did you ever hear of ?" asked, Is not that all the world ? " were the prettiest in all the world that Willie knew. "The old bantam left her chickens yesterday, Willie,"
self; but I am not old enough to part with my mother." "Not quite old enough for either, Willie," said Mrs.
straight home, Willie, and don't take off the cover." how shall I know which is George's?" Oh, it's no matter which. They look just alike." "Oh, Russel! he said, "guess what is in this basket." "Guess! I guess it's nothing." pletest little bantams you ever saw." "I don't believe it, Will." and he pulled up the cover. There, ain't they bantams! web feet! Do you see, Russel ?" out, and would have escaped, but Russel caught it. basket dropped and rolled some way down the hill. did not, and on he went. is one in the basket, and one in my apron. See, mother!" it ?" he said. "Do see, mother, how its head hangs down. It don't move. Mother, do look! What is the matter ? " held it too tight. You have smothered it, my child." tears, and said it must have happened when he fell down. He cried bitterly, and his mother tried to comfort him. Did Mrs. Bemis say that was George's, Willie?" "No, mother; but she said it was no matter which." "But it is now a great deal of matter which." "I know it is, mother." the chicken, what would you think he ought to do?" chicken; and, mother, I will do as I would be done by. very easy to do as we would be done by." done by, or the bantam ?" returned from 0--, a widow with three children. Mrs.
but the heads and hearts those bonnets and gowns covered. not very well, and wanted very much to see Miss S-." in store for those who love her and seek her favours. plant, we learn something of its character or use. things-all such sort of things," he added, with a smile. science that describes plants and explains their nature." a pleasure as flowers are to those that love them. like the voice of one of the family." love birds is well as flowers ?" does mother always say?" I asked. sing, just as much as if we could say 'they are mine!'" 'God giveth to us all liberally, and withholdeth not.'" keeping? How, think you, did it learn? who teaches it? Some birds work quicker and more skilfully than others. much difference between them as between housewives. Some are neat and quick, and others slatternly and slow. feathers and strutting about the yard, is named Narcissus. little mistress of the poultry-yard. good husband, was almost always to be seen near her. more thought in all the animal creation than we dream of. love to one another, for the love they have lost." stretch up their little necks to receive it. them, "I'll put a shot into that robin's head." "Done !" said the other; and done it was for our poor little mother. nocent enjoyment nor inflict unnecessary and useless pain. Our attention was, for some days, taken off the birds. done all I could for mother!" The day after the funeral I went to see the children. brook I have mentioned, I saw Sam Sibley loitering along. animals will not care for the feelings of their companions. "Everything I love dies!" I did not reply, I could not. note; but he will never sing again!" at a bird so long as I live." happy, for that is what God made you for." praise they receive, but the good they do. hmrnng, anb her Thrg frpntun. always want him to go. Neptune Neptune ! 42 FANNY, AND HER DOG NEPTUNE. companion and cousin, Sarah Tileson. not had any nurse ever since we came to Rose Lane ?" persuade my mother to get such a dog as Neptune. had just got over the fence and was approaching them. stranger was quite out of sight, when he ran on as before. "Does he really know that he has to take care of you?" speak; but he seems to know almost everything." sent me a present of a pair of emerald ear-rings." savages, and so mamma sent them back to Mr. Wilson." Was not he affronted ?" me; and besides, papa told him the dog was mine." But would not you sell him for ten pounds, Fanny?" No, indeed, I would not." 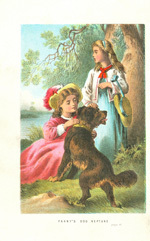 44 FANNY, AND HER DOG NEPTUNE. would not go in any dangerous places." "You promised, Fanny; I did not." and so that is just the same." were not quite so strict as Fanny's. unclouded sun of one of the brightest afternoons of June. opposed it, Sarah followed, bent on getting the flowers. hold by the rosebush, you know." would call that a dangerous place." white stars-I can get them perfectly well." are wet and slippery ?" 46 FANNY, AND HER DOG NEPTUNE. place for you to stand, and my feet slip so." she had advanced to the position Sarah had pointed out. would. He wagged his tail and whined, but did not move. "Now, Sarah, stop crying, and don't be frightened. the other; there-set your foot hard down." ence of mind to enable her to obey Fanny's instructions. clothes in his mouth, he swam with her several yards. dog could do to express his joy. Fanny could not then express her gratitude to him. she saw a man passing. 48 FANNY, AND HER DOG NEPTUNE. know what to do for her." "if it's warmth can come to this little cold body again." stay, had come out to meet her. in vain. Life never returned. realized it before. "Oh, how suddenly death may come!" to me I never knew it-at least, I never felt it till now. and God seems far nearer than before." "What are you thinking, my child ?" Fanny told her. in this world. Only think of poor Aunt Tileson !" and to endure the distress with patience." were, before long, put to a painful test. 50 FANNY, AND HER DOG NEPTUNE. perty. Our young friends must live and learn. Mrs.
till about a year after Sarah Tileson's death, when Mr. The preparations for leaving Rose Lane went on rapidly. Mrs. Dale had engaged a place as book-keeper with Mrs.
Mr. Thorne, a neighbour, and very kind friend of Mrs.
was too full of gratitude to leave any room for regret. we shall have good times after all "
"No, Fanny, I am not tired." at leaving Rose Lane ?" minds to that long ago." 52 FANNY, AND HER DOG NEPTUNE. been crying, and you won't tell me why." of her concerns that the child could fully comprehend. it was to be paid. "For some purchases of your father," replied Mrs.
mind, was surprised at her emotion. sacrifice, I trust we shouldfeel enough to make it." the conflict going on there. she said, "I am going down to Emma Blake's, mother. bonnet, and followed as usual by Neptune, left the house. reached a certain beech-tree, her favourite resting-place. 54 FANNY, AND HER DOG NEPTUNE. Neptune; as good a fellow as ever, I suppose ?" "Ten times better, sir," said Fanny. But why not, Miss Fanny ?" I could not, sir. I would as soon sell a human being. girls of ten years would have done. tune; I dare say we shall both feel better when it's over." struck by the unusual sadness of her voice. gathered about her, expressing their surprise and horror. 56 FANNY, AND HER DOG NEPTUNE. him to pay you a daily visit." dreading to expose her feelings before so many spectators. of duty, without any suggestion or persuasion of mine." time for her real friends. fort. She returned there about Christmas. the entry, there was an unusually loud ring at the door. dressed to "1V iss Fanny Dale, Houston Street." Came to our house one day. Beneath our roof should be. Chose birds a better lot. Where sun and river played. For none their will gainsayed. And planned their household cheerily. In field or forest bred. Than to his mate he cooed. And call to her aloud. That he had brought for her. Accept a veil of lace. Or balanced on the air. Songs of a loving pair. Could scarcely see them go. And never stayed out late. To find her needful food. Or thread and needle take. With insects from the air. They had so much to do. The young ones would not follow. They'd take more time to grow. And watched the nest the while. To see how it was done. And mock their twittering cries. And with a great ado. In all the flying schools. To learn their lessons well. To all their friendly neighbours. In which I take my nap. And never get home dry. Like figures on an urn. With heads beneath their wings. They had some falling out. Flock to the tall old tree. They seemed to like it best. And swing upon the hoops. Just as when human beings roam. Where lived his darling mother. To catch the sleepy flies. They had no cause for dread. To wish that spring would come.